We all know them – the picky eater, the person who “plays” with their food, or the one who cannot have the things on their plate touch. I remember, years ago, hearing of a study where they tied male personality types to how they ate their food. But, did you know that horses have different eating personalities too? Well, my little herd is a microcosm of the range of grazing personalities. Tonight we took everyone out for a little hand grazing. Not blessed with either an irrigation system nor year round rain, we only see grass in the Spring. With little rain this Winter, and Spring weather coming much earlier than the season itself, the grass is already very high and will be short lived. When it’s here, I like to take as much advantage as possible – an approach the horses enthusiastically embrace! 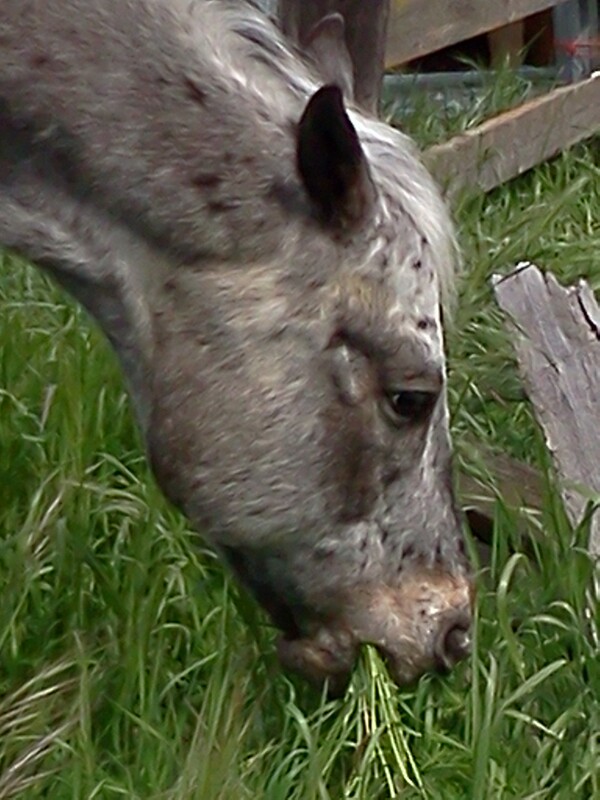 But I particularly enjoy our times of hand grazing, as an opportunity to observe the diverse personalities we live with. Coffee, The Sneak: Before coming here, Coffee was the privileged boy – growing up where he had access to irrigated, well groomed grass. As a result, his general preference runs toward the short, new or mowed grasses. He will partake of taller grasses, but will always migrate to the shorter blades at the first opportunity. However, moving from only the finest groomed pasture grass to our more rough and ready property created a slight quirkiness – he has developed a taste for bushes and trees. All horses will try them now and again, but Coffee has developed a particular talent for grabbing anything green from waste-height or above. From the moment he arrived, he was voracious for any new tasting experience! Literally, anything green was fair game. Fortunately, I’ve been careful to avoid toxic plants on the property, because he is not discerning! Along the way he developed one particular preference – roses. I have lots of roses … and if you graze Coffee anywhere near one, don’t turn away! If you dare look away, you’ll turn back to find a rose branch hanging from his mouth! Java, The Peripatetic: Since he was very young, Java has been the ever moving grazer. 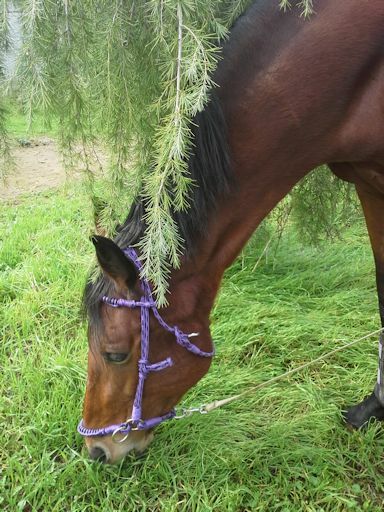 By that I do not mean the typical movement horses make while grazing – take a few bites, move a step or two, take a few more bites. No, with Java, it’s take a bite or two, march a hundred feet, take another bite or two, march another hundred feet … on and on. Hand grazing him is more exercise than relaxation! We have tried for years to get him to settle, but the best we can usually do is stand still ourselves and let him “lunge” himself around us. Less exercise for us, but still far from relaxing! (Notice I don’t have a picture – he won’t stay still long enough!) The interesting thing about this is that Java is not a hyper or energetic horse – far from it! His general demeanor is mellow, and his energy level tends to be low … but there is something about grazing that makes him want to move. Nash, The Finicky: He is the “gourmet” in the bunch. Nash will smell a patch of grass before he will deign to take a taste. In some cases, he will walk past long patches of lovely tall grass, his head cocked slightly as he smells on his way, until he finds a small bunch that is to his taste. I wish I had his sense of smell, or could ask him why that grass is not suitable – because every other member of the herd will happily munch on patches that Nash will have nothing to do with! Tonight we traveled the whole length of the barnyard, occasionally sampling along the way, until we landed upon a patch that was up to his high standards. Once he’d mowed that small patch, we were on the march again, past some lovely swaying blades (which Coffee found perfectly suitable), until we found another patch he would deign to munch. Like Java, Nash can be exhausting to graze. The big difference is that once he finds a suitable patch, he is all concentration until it is depleted – so you get moments to catch your breath. 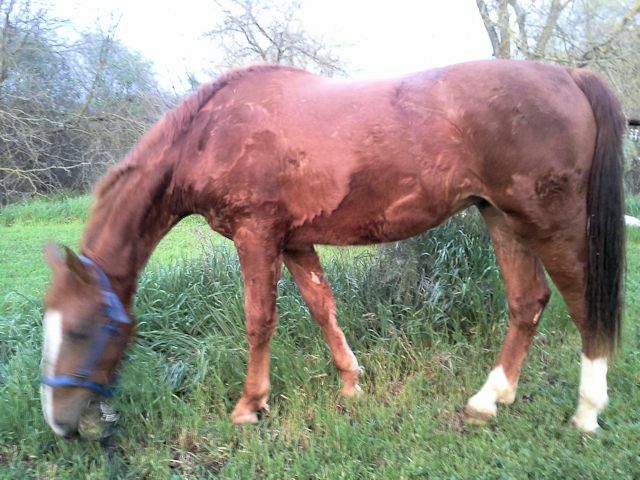 Noble, The Casual Eater: My redhead grew up not knowing what grass was. He was born in the summer, on a property so overgrazed that everyone lived on dirt lots. When he first encountered grass, in his early months here, he actually didn’t know what to do with the stuff! No joke – he snuffled around in the green stuff seeming very puzzled. It took having Coffee graze next to him to give him the idea of what to do. From that time forward, he’s been a fan of the green stuff! Given the choice, he will leave hay and seek grass. However, he is the most casual of our grazers. He will take a mouthful, then he chews it methodically while scanning the horizon for neighborhood activity. That mouthful well and thoroughly masticated, he swallows before reaching down to fill his mouth … then up for more sight seeing. He wanders more than Coffee or Tally, but casually and far less broadly than Nash or Java. Hand grazing him is generally a very relaxing experience. Tally, The Eating Machine: My girl was raised in our back acre running with Auntie Dani. During the grassy season, they had plenty to eat – so she did not grow up deprived of the green stuff. Yet, grazing her is a bit like taking the lawn mower out in a halter. She bites off grass at a speed so rapid that she cannot possibly consume it all – so she leaves a trail of cut grass in her wake. Unless the neighbors make noise, she rarely raises her head from the ground. She generally wanders only as much as is necessary to move to uncropped regions. This girl is all business! She is determined to make the most of the grazing time she is given. Tally is also a stress eater – when worked up about something, she will start to graze quite rapidly, often just letting it all fall out as she goes. You can tell when she is coming back down, as the speed of grazing slows and she begins to chew and swallow again. It’s fascinating to watch each of their different personalities come out in such a mundane act as eating (although I still can’t explain Java). 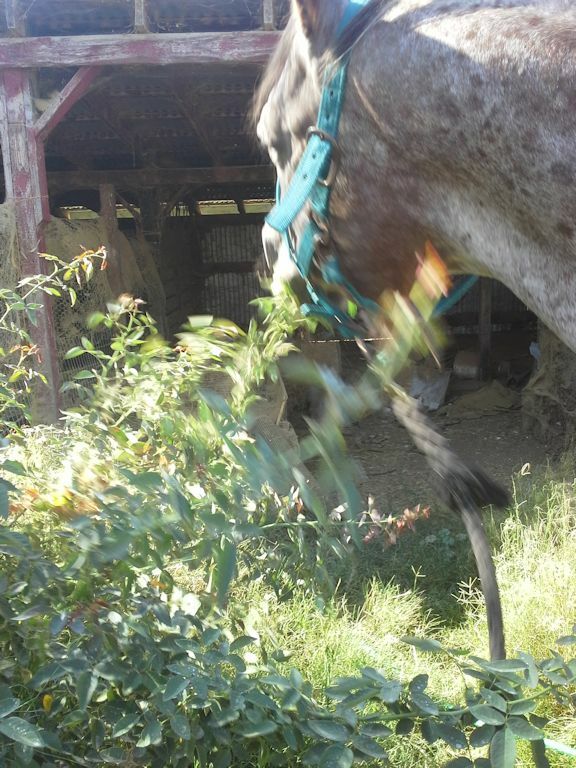 What kind of grazer is your horse? If you aren’t sure, I’m certain they’d be happy to indulge your “scientific” observation. This entry was posted in My Journey and tagged Coffee, grazing, Java, Nash, Noble, personalities, Tally. Bookmark the permalink.